Rockwell Hardness testing is a system for determining the hardness of metals and alloys of all kinds. The American Society for Testing and Materials (ASTM) has established a standard recognized worldwide to help manufacturers maintain the qualities they want in their products. ASTM Standards E-18 and E-110 defines the test method and parameters for a valid test using portable hardness testers. Rockwell is a way of measuring the hardness of materials. 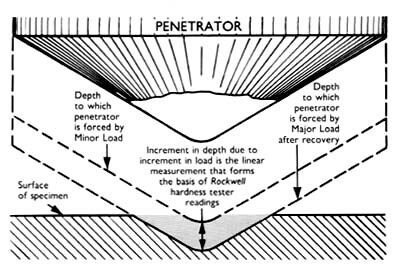 Hardness means the resistance to penetration. This test gets its name from Stanley P. Rockwell who invented the test and the original hardness testing machines. When testing metals, indentation hardness correlates with the strength of the material. This important relation permits economically important nondestructive testing of bulk metal deliveries with lightweight, portable equipment, such as hand-held Rockwell hardness testers, which are each individually calibrated for accurate readings. The advantage of Rockwell hardness is its ability to display hardness values directly. This reduces all the tedious calculations involved in other ways used for the hardness measurement of materials. It has a massive following in the commercial arena because of its speed, reliability, robustness, resolution and tiny area of indentation. Regular Rockwell Hardness Testing- This type of testing Measures the bulk hardness of the specific material that is being used. Various scales are used for ferrous metals, nonferrous metals, and even plastics. Rockwell hardness scales include A, B,C and F for metals and M and R for polymers. 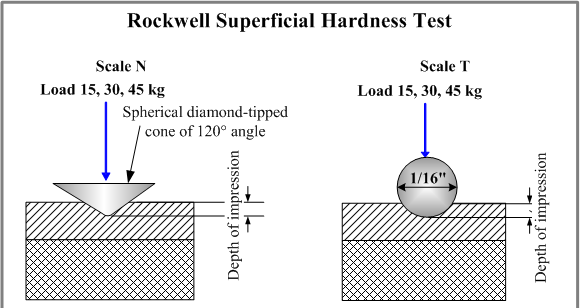 Superficial Rockwell Hardness Testing- This type of Rockwell testing uses a surface-sensitive measurement of hardness, rather than measuring the bulk hardness of the metal or plastic. This process is valuable for testing thin samples of materials, samples with hardness gradients at the surface, and small areas. Superficial Rockwell hardness scales are N and T for metals and W, X and Y for nonmetallic materials and soft coatings. Home » What is Rockwell Hardness?